Line form the film: "Despite its great power, the sea invites contemplation"
I was so impressed with director Greg MacGillivray’s Coral Reef Adventure that I wanted to check out a few of his other films, and sure enough, 1995’s The Living Sea is every bit as stylish as that 2003 movie was. “There is only one ocean”, says narrator Meryl Streep towards the beginning of The Living Sea, “The World Ocean”, and this is exactly what MacGillivray and his crew set out to prove. Ignoring boundaries laid down on a map, fish swim from one region of the globe to another, and tides move in every direction. Working as a single unit, the oceans, in unison with mankind, ensure that life on this planet, both on land and under the sea, continues to flourish. 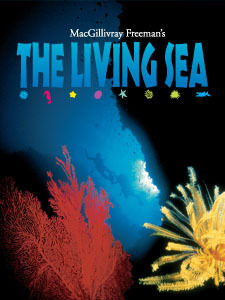 From the Pacific Northwest to the waterways of Asia, The Living Sea travels all across the world, and, much like Coral Reef Adventure, features gorgeous underwater photography, capturing a young family’s scuba-diving expedition in the Palau islands, and following a researcher as she studies a new species of jellyfish (in addition, there are some awesome shots of humpbacked whales, not to mention a deep-sea diving expedition that makes a startling discovery of its own). I’m also a fan of the movie’s various time lapse sequences (revealing, among other things, the hustle and bustle of San Francisco harbor), and MacGillivray even manages to throw a little excitement into the mix, detailing the trials and tribulations that coast guard rescuers face along the shores of Oregon, and showing surfers in Hawaii doing what they do best. An award-winning filmmaker, MacGillivray has worked on a number of documentaries over the years, most of which are water-related (his first movie, 1967’s Free and Easy, covered longboard surfing in California and Hawaii, while his most recent project in 2015 focused on Humpback Whales), and as Coral Reef Adventure and this film have proven, he’s an expert at spotting the natural beauty, as well as the wonder, of life at the bottom of the sea.